Summer jazz returns to the Alley Theatre. The Alley Theatre, Strabane is delighted to be welcoming back renowned Jazz musicians ‘Jazz Gazette’ for their summer residency with four dates throughout the month of August. Jazz lovers can enjoy evenings full of swing, rhythm and blues. Now in their 7th year performing in the Alley Theatre ‘Jazz Gazette’ are a firm favourite with audiences and love performing in the relaxed Alley bar. Jazz Gazette are the longest and most established jazz band in the North West and regularly perform all over Ireland at festivals such as City of Derry Jazz Festival & Sligo Jazz Festival weddings, parties, functions and hotels. 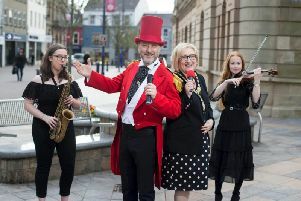 Created by Strabane’s very own Gerard Bradley in the early 1980’s the band have enjoyed over 30 years in the business and have performed with the very best vocalists and musicians over the years such as ‘The Rat Pack’ Orchestra, Joan Talbot, Triona Sweeney and Gary Cox to name but a few. The band features Mark Bradley trumpet/vocals, Gerard Bradley piano /vocals, Peter Doherty double bass and Aidan Dunphy Drums. The line-up of wonderful musicians with the smooth vocals of guest artists will make these gigs not to be missed. So come along and enjoy a mix of classic swing numbers through to contemporary funk and soul. Tickets for all nights are £5 and available from the Alley Theatre on www.alley-theatre.com or call 028 71884760.